I've always been a fan of the principle that the best way to save water is to shower with a friend. 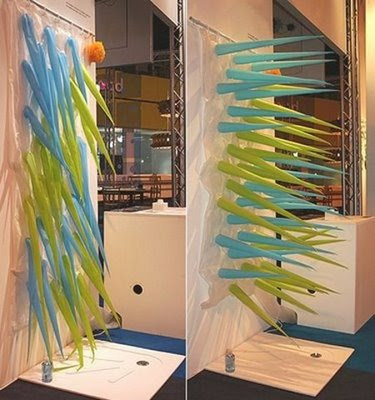 Designer Elisabeth Beucher of the design collective Puff & Flock has taken a different direction and designed a shower curtain that slowly inflates spikes as you shower. It looks more annoying than dangerous but the idea is that you save water by taking a shorter shower due to the hassle. I know it is just a design concept to make you think but does it really need to run off a pump the size of a washing machine? Look at that box in the background. Beucher also designed a shower curtain that inflates and slowly closes in around you like a giant wet burrito. Both are clever, but I'll stick with a low flow shower head.